ESD Smock testing procedure requires the fabric to be measured “static dissipative” on the Ohms Scale, and to be grounded (bonded electrically to a grounding system) so that it is not an isolated floating conductor. In this article, I review how ANSI / ESD S20.20-2014 defines ESD Smocks and explain the “isolated floating conductor” issue with wearing ESD clothing. 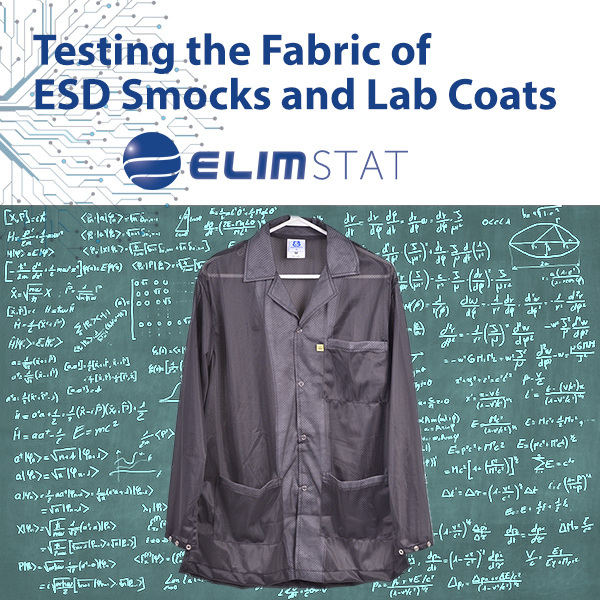 The minimal definition of an ESD smock is that it is static dissipative. This means that measured panel-to-panel it has less than 1 x 1011 ohms of surface resistance. A “Static Control Garment” has < 1 x 1011 ohms surface resistance measured point-to-point on the garment. To perform this test the garment should be electrically isolated, (laying on an insulative surface). Then, place the electrodes connected to the meter on the sleeve panels of the garment. The meter will measure the lowest resistance path between the electrodes placed on the sleeve panels. This is sometimes also referred to as a “panel-to-panel conductivity” test. The reason being that it measures resistance through all the panels of the garment: sleeves, torso, etc. A “Groundable Static Control Garment” has < 1 x 109 ohms surface resistance measured point-to-groundable point. To perform this test, you will replace one of the electrodes that were on one of the sleeve panels with a ground. The requirement of fewer than 1 x 109 ohms (1 gigohm) of resistance is significant in that it correlates with ANSI/ESD S4.1’s recommendation for workstation mats and TR53’s recommendation for shoe grounders. A “Groundable Static Control Garment System” has < 3.5 x 107 ohms surface resistance measured point-to-groundable point with a person wearing it while connected by the wrist strap. This is significant in that it correlates withTR53’s recommendation that wrist straps have a resistance of < 3.5 x 107 ohms. ESD smocks are precisely “groundable” because they are woven with conductive black carbon threading. The black carbon threading woven into the cotton or polyester of an ESD Smock is what gives it panel-to-panel conductivity. If an ESD Garment is not electrically bonded to mats, wrist straps, or floors that are grounded it becomes a floating lightning rod- an “isolated floating conductor” essentially. The standard used for creating a grounding system is “ANSI / ESD 6.1 ESD Association Standard for the Protection of Electrostatic Discharge Susceptible Items – Grounding”. Previous post: How Do Shoe Grounders Work?